Once the training on a bed is over, start the training for the Singular Method with the colon model (Chart 16-1). The Singular Method has been established and chosen among various insertion techniques to insert the scope most effectively on the colon model. Practice the Singular Method on this model. The colon model training is a two-step training: first use the right index finger as the scope and learn the Singular Method. Then use the actual fiberscope on the colon model to master it. Think about learning automobile driving skill. You improve faster when you learn it on a race circuit than on a regular street. 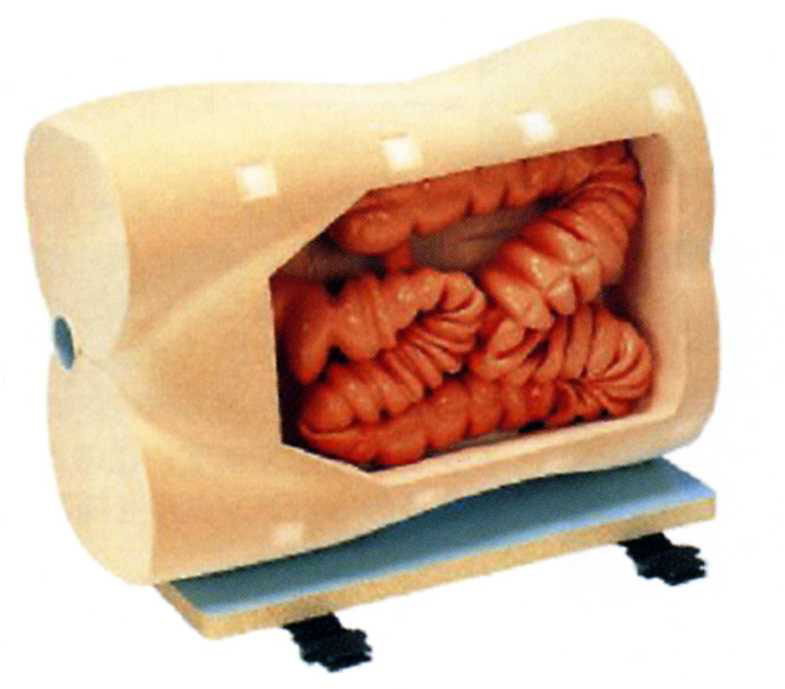 Likewise, the insertion technique improves faster on a colon model than a real human body. Mastering this technique can hardly be acquired without the appropriate colon model training. It is not an exaggeration to say that colon model method is the one and only way to master the colonoscopy insertion technique. Learn the Singular Method with the "finger-scope"
On the colon model, first practice the sigmoid colon push method (Chart 16-2). For the transverse colon, the pull method is practiced from the beginning. Then the pull method applied to the sigmoid colon should be thoroughly trained. The insertion time should be at longest three minutes, ideally under one minute. Start with the thick scopes and gradually practice with the thin scopes. Schedule 16-1 is the direction of the Singular Method for each segment of the colon. The time shown in the schedule indicates the left hand's position, unless written otherwise. Master with the finger-scope, learning with the finger literally, not just memorizing it. Start at 12 o'clock, the home position. Rotate counterclockwise to 6 o'clock (the tip at 12 o'clock, according to the double angular velocity). During this rotation, the tip would proceed to the sigmoid colon. Once in the sigmoid, rotate back the scope to 9 o'clock to move the "s-top" to the upside. With the s-top upward, push the scope with the up angulation and traverse the angle. In the latter part of the sigmoid colon withdraw the scope carefully not to hit the scope on the wall. At around 10:30, the acute angle of the SD comes into view rightward. Traverse with the right angulation and rotate clockwise to 12 o'clock and pass the SD with the up angulation. At 12 o'clock, push the scope with the up angulation and traverse the splenic flexure. Confirm the triangular lumen of the transverse colon and withdraw the scope and make sure it is 40cm (the former half is complete). Change the position to the supine posture. With the tip of the scope at 9 o'clock (the left hand is at 10:30), push the scope straightforwardly while an assistant presses the lower abdomen. At 10:30, traverse the mid-transverse downward with the down angulation, pull the scope immediately to shorten the transverse colon. Rotate counterclockwise to 7:30 and shift from the down angulation to the left angulation. Come up against the wall with the left angulation and rotate to 9 o'clock to find the right bend of the hepatic flexure. Traverse the flexure with the right angulation and rotate clockwise to 12 o'clock. Finally with the up angulation, the scope reaches the cecum. The Singular Method starts at the home position and rotates counterclockwise and then counterclockwise back to the original position. At this point the tip of the scope is at the splenic flexure where the first half of the insertion is complete. Likewise, in the second half after the position change rotate counterclockwise and clockwise back to the home position, reaching at the cecum. In short, full intubation can be achieved with two back-and-forth trips of the left hand (Chart 16-3). It consists of two back-and-forth movements of the left hand; start from the home position and rotate counterclockwise and clockwise back to the home position in the former half, and the same movement in the latter half.